JACKSONVILLE, Fla. (AP) — Blake Bortles isn’t quite ready to focus on his future with the franchise. Bortles will start a regular-season game on the bench for the first time since Sept. 14, 2014, serving as Cody Kessler’s backup against Indianapolis (6-5) on Sunday. Bortles sounded like someone who knows his time with Jacksonville is nearing the end. Bortles signed a three-year, $54 million contract in February and will count $21 million against the salary cap in 2019. If the Jags cut him before June 1, they would still take a $16.5 million hit against the cap. The fifth-year pro and third overall pick in the 2014 NFL draft seemed resigned to — at the very least — having to compete for the starting job next year. Coach Doug Marrone benched Bortles and fired offensive coordinator Nathaniel Hackett on the same day. He promoted Kessler and will have quarterbacks coach Scott Milanovich call plays. Kessler hasn’t taken many first-team reps since training camp, so he needs to develop some chemistry with his offensive linemen and receiving corps. He also won’t have running back Leonard Fournette (suspension) or three starting offensive linemen: left tackle Cam Robinson, left guard Andrew Norwell and center Brandon Linder. All three are on injured reserve. Bortles took the benching in stride, saying and doing all the right things in his reduced role. He said he learned from longtime Jaguars backup Chad Henne how to handle getting benched and being a career backup. 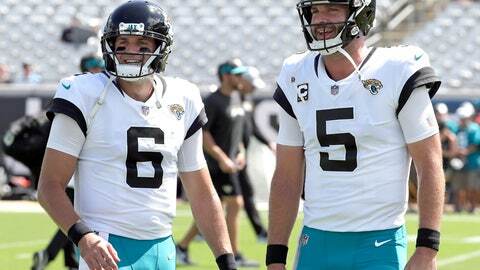 “One thing I’ve always said that I thought was one of the most incredible things I’ve ever seen is how Chad handled going from being the starter to the backup and how he was able to maturely handle that and be there for me and do whatever I needed or help me out in any way,” Bortles said. “Anytime I’ve ever been in that situation, that’s all I’ll try and do is kind of what he did and what I witnessed him do.